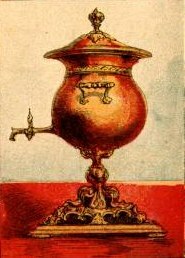 Colored clip-art like drawing of a copper urn or samovar on a red tablecloth. This kitchen image is in the public domain. Download it for your next project.